Top ten killer bites according to BBC's Earth Unplugged. Fascinating facts about great white sharks. Watch a video clip about why some deadly animals have bright markings. Discover a top ten of animal venoms from BBC's Earth Unplugged. Find out more about poison arrow frogs. See mosquitoes under a scanning electron microscope and find out how they hunt you. Find out about the deadliest scorpions. Meet a giant desert hairy scorpion that lives in the Sonoran Desert. See tarantulas and other spiders and find out lots of spider facts. See Asian giant hornets and find out what makes them so fearsome. Watch a video clip about Burmese pythons in the USA Florida Everglades. Watch a king cobra threaten an enemy. Examine the body and fangs of a western diamondback rattlesnake. See how meerkats defend themselves against a deadly cobra. 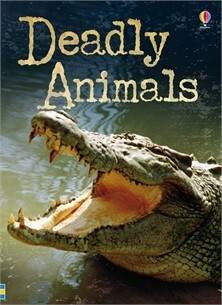 Join a professional animal handler as he finds a coral snake and a water moccasin, a type of viper. Fascinating facts about the Komodo dragon. Meet a gila monster, a venomous lizard found in the USA. See an enormous American alligator in the wild. Watch a cheetah chase a gazelle. Find out about the hunting skills of a tiger and the tactics its prey uses to survive. Meet some wolves find out some deadly facts about them. Watch a wolf up close as it howls with its pack. Find out how to survive an encounter with a grizzly bear, a type of brown bear found in North America. See elephants charging wildlife photographers on a river. Discover the deadly tactics of killer whales hunting sea lions. Watch a video clip of great whites swimming, eating and hunting. See vivid blue spots appear on the body of a blue-ringed octopus as it attacks a crab. Watch a poisonous stonefish as it strikes without warning. Reasons to be afraid of an octopus. See how a wildlife reserve in Kenya, Africa, uses drones, armed police and dogs to fight rhino and other wildlife poaching. Find out about jaguars and conservation efforts to help them survive. Watch a clip about efforts to save the world's most endangered rhino, the Sumatran rhino. Meet some of the world's most endangered animals.